The Lady Q from Artery Vapor is an ultra discreet vaporizer starter kit that incorporates a 1.5ml Sub-Ohm Tank with magnetic connection that can be stored inside the battery housing with a lipstick-style design. 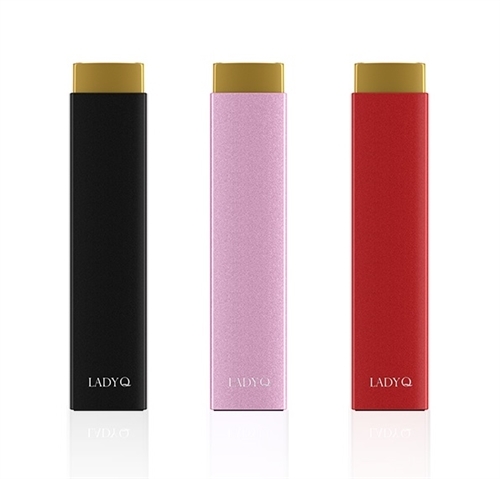 The Lady Q has direct voltage output, which is based on the state of its 1000 mAh built in battery and a unique touch fire button with an indicator light ring is used to fire the device. The Lady Q utilizes a magnetic sub-ohm tank system that has a threaded top fill method and is capable of holding up to 1.5ml of E-Liquid. The tank also features an adjustable airflow control ring with four airflow settings and includes a 0.7 ohm LQC coil that is capable of running 15 to 25W (also cross-compatible with Nautilus BVC coils). The Lady Q is designed with the female vaper in mind and maintains a high performance function in a portable and stylish housing.